The text below is an attempt at drawing up a new programme/collaboration/network for exploring claims about food and cooking. Hereby, we make an effort to start a new international and interdisciplinary network to explore such claims from various angles. If you are a researcher (from any field), teacher at any level, chef or something else and find this interesting, read on and feel free to contact us. The programme is drawn out by researchers from Finland (here and here) and myself. Is it true that you mustn't rinse, but rather brush, mushrooms? Should a steak be seared to keep the juices inside? Can you prevent fruit salad from turning brown by sprinkling it with lemon juice? Such apparently mundane questions have been source of inspiration for food geeks at least since “The Curious cook” by Harold McGee (1990) was published, but most likely much earlier. A closer analysis of such questions reveal an abundance of intriguing, surprisingly complex and unexplored questions which might be vehicles for education and even subject for research within natural and social sciences. The world of food and cooking is full of statements on how to do things and occasionally why one should adhere to these advices. Many are rooted in tradition or are created today by us all and sometimes appear to us like modern urban stories. Some are rooted in long experience of kitchen professionals or home cooks, and some even in science. When tradition and science meet interesting things might happen. In some cases the phenomenon in question (see examples in the introduction) is well described within one field of science but is less so in another discipline, laying questions open for research. Secondly, such culinary claims, which we have termed “Kitchen stories”, provide valuable opportunities in education at various levels (see below). Thirdly, interesting questions might be revealed by laypeople, craftsmen (chefs, artisans) or even school children which in turn could end up as relevant research topics to be studied within various sciences. Finally, such kitchen stories are valuable parts of our cultural heritage and provide rich research material for scientific fields such as cultural history and sociology (see figure). Twice a semester Pennsylvania State University holds its Ed Waterbury Lecture on science, technology, mathematics, engineering and mathematics education. This autumn, one of my main sources of inspiration concerning argumentation in science was the invited lecturer. Prof. Sibel Erduran from University of Bristol is a renown researcher, author and lecturer in fields such as science education, argumentation in science education and philosophy of chemistry. Her contribution to a seminar at the University of Oslo a few years ago was the starting point of my interest in argumentation in science education. In fact, this was the main impulse for me getting involved in what we now call "the Kitchen stories project" (see below). Her 1 hr lecture + Q/A session at Penn State University was on the topic of argumentation in education (mainly middle school) and professional development of teachers, titled "Modeling Epistemic Practices in Teachers' Learning: The case of argumentation". This lecture is available on the university's web pages (open access, hopefully online for a long time). Sibel Erduran: "Modeling Epistemic Practices in Teachers' Learning: The case of argumentation"
Introduction in Norwegian: I anledning denne ukas episode om mirakelfrukt på Schrödingers katt på NRK (og YouTube) publiserer jeg to blogginnlegg om temaet. Det første er en reprise av et tidligere innlegg, dog utvidet med noen flere smakstester. Det påfølgende er en samling fakta om mirakelfrukt med referanser til primærlitteraturen. Siden denne bloggen normalt er på engelsk fortsetter jeg herved på engelsk. Innlegg nr. 1 av 2 følger nedenfor. On the occasion of me attending this week's episode of the Norwegian popsci TV series "Schrödingers katt" (and YouTube) about miracle fruit I'll post two entries on miracle fruit/miraculin. The first is a reposting on a previous entry, expanded with a few more tasting notes. The second post will be a collection of facts about miracle fruit including references to primary literature. Part 1:2 follows below. The following entry was previously published 7 August 2010, slightly revised. Note: the original blog entry has some interesting comments worth having a look at. For some time now, there has been somewhat of a hype about the miraculous berry that makes everything sour taste sweet. Some time ago, I ordered a packet of dried and powdered miracle fruit tablets and gave it a try. The following post gives some background and the results of a truly fascinating experience. The miracle fruit is a a berry containing the glycoprotein miraculin with the unlikely effect that when your taste buds meet this substance, you taste sour foods as they were sweet. That is, your perception of sourness is altered. In certain parts of the world, the substance has been used for quite long, whereas in USA and Europe it has not yet been cleared for use as additive. The berry in itself is allowed, but unfortunately they don't keep for long and are apparently not suited for shipping fresh. However, a freeze dried version made into tablets does exist and this is the version I tried. First day of September this year Norway saw a new centre for children's food culture located in an old renaissance farm in the middle of Oslo. This is to be a national resource for helping schools and pre-schools to focus on good food and food culture. In the Norwegian curriculum the subject home economics ("Food and health") is given throughout primary and lower secondary school. Many would say that this subject does not enjoy much credit of being a "serious" subject in competition with mathematics, language, science etc. There does not even exist school books in this subject for primary school pupils(!) and the subject has not enjoyed the benefits of having its own "national centre for education" to support schools and teachers the same way as many other school subjects (e.g. Norwegian Centre for Science Education). In this post I summarise the last seminar I attended at the Norwegian Barista Championships this spring. It was hosted by former world champion barista Tim Wendelboe and focussed on coffee roasting. The following is what I understood from this seminar. As a coffee drinker, I find it interesting to get to know the various roasters' profiles, or roasting personalities so to say. I believe each of the four Norwegian roasters I've gotten to know best have their own rather distinct style. The smallest, Madelynn coffee, have a fairly dark roasting profile resulting in more chocolatey and "brown" aromas with less acidity (and perhaps fruitiness) compared to the other "extreme" among the four of Tim Wendelboe. 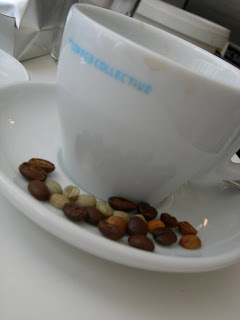 The coffees from Wendelboe seem to me as extremely clean and rich in acidity, but with slender body. Kaffa roasters, on the other hand, are on the lighter side of roasting but with more full-bodied coffees compared to Wendelboe (some of Kaffa's natural/dry processed coffees are among my all time favourites, I must admit). Finally, Solberg & Hansen being by far the largest speciality coffee roaster in Norway, produces such a wide variety of coffees and roasts that the wide variety might be said to constitute their profile, rather than a specific roasting ideal. In this third post from this spring's Norwegian Barista Championships I summarise the most interesting seminar I attended. 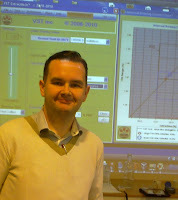 It was hosted by former world champion barista Tim Wendelboe and focussed on tasting defects in coffee. I attended two seminars by Tim Wendelboe during this year's event, and of the two the one mentioned here was definitely the most rewarding for me personally. at least two reasons for this. The first is past crop vs. new crop. 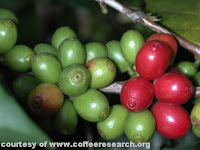 Past crop = coffee that has been stored for some while (e.g. last season's crop) before roasting and sale. This is a typical problem if you are served, say, a Costa Rica coffee this summer because the harvest season is August-December. 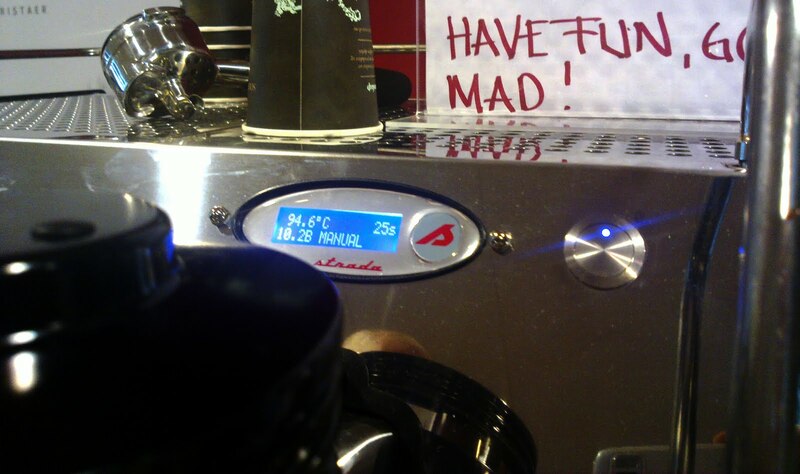 The second reason for fading is a processing defect if temperature has been too high during drying (e.g. using closed greenhouse-like drying houses with too little airflow). The characteristic of faded coffee is on my palate more subtle and not that critical a defect, but results in lower fruitiness and more woody flavour. The acidity might still be there, but the fruit is more or less gone. So if you get a bag of great Kenya or Panama coffee out of season, don't be surprised if you can't taste all they claim it does on the description on the bag. Also, this defect is easy to get your hands on, even among speciality dealers. Get your hands on a bag of Indian Monsooned Malabar or some Old Brown Java Coffee from Indonesia. These coffees are deliberately aged at the green bean stage to develop a flavour which one would consider being a defect in most other coffee. many inexpensive coffees are being uncritically strip picked resulting in a mixture of overripe, unripe and ripe beans; everything is picked at the same time and nothing is thrown away. Characteristic defect flavour would be peanut, old nuts and unpleasant acidity. I would add that unripes also would give a pea-like or grass-like flavour (picture by courtesy of www.coffeeresearch.org). In this second post I summarise shortly the first three seminars I attended during the Norwegian Barista Championships this year. As mentioned in the previous post, the championships were not only competitions but also a number of seminars and exhibitions (the full programme is given in part 1). The seminars I attended, and thus am able to give some personal reflections upon are described below and in a following post. 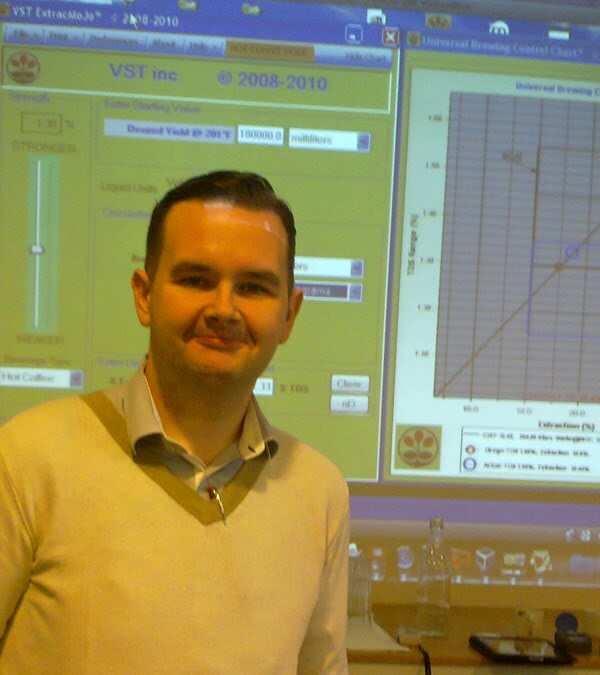 This 1.5 hr seminar was given by invited contributor David Walsh working with R&D at Marco beverage systems in Ireland (although their web site is a commercial one they've published quite a lot of educational material such as articles and ppt slides). The presentation was in fact much more than a presentation of the Extract Mojo, and the session was a very clear and systematic presentation of coffee extraction in general. Questions discussed and explained were e.g. I came to this event without many expectation, mostly because I didn't know what to expect. I was quite optimistic because the organisers had made a great effort to promote the event to the general public (see previous post). 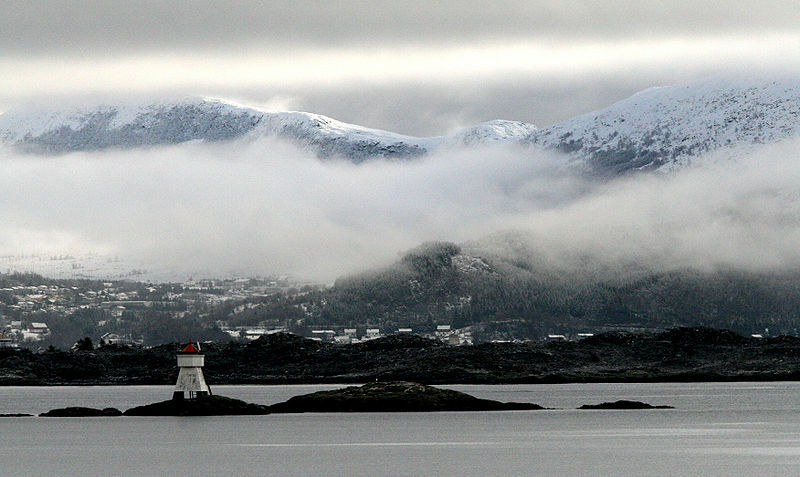 This year, the Norwegian barista championships is held in Ulsteinvik on the western coast. In addition to lectures, exhibitions etc., several competitions are held. Among the most interesting things is that the cup taster championship is now open for non-professionals. Also, I talked to the host for this year's competition: Kaffikari. Last week, I went over to Ulsteinvik to have a chat with Kari Janne Andersen, proprietor of Kaffikari coffee bar & kitchen and got some excellent coffee/espresso as well (her espresso is among the very best I've had). I wanted to know a bit about this years Norwegian barista championships which are held in Kaffikari's hometown, Ulsteinvik. More about the other competitions below, but first a few thoughts by Kari on the upcoming competitions and what makes this year's event different. fooducation: What are your thoughts about reaching a larger audience through this year's competitions. Is that a goal? Why? Kari: Previous years, the competition has been held in rather secluded places; the offices of a producer in an industrial area, inside the Norwegian gastronomic institute and such places. One of the unique features about this year's competition is that it is held in an open venue which invites a non-specialist public in a whole new way. fooducation: Was this your idea, or...? Kari: The initiative is thanks to the Norwegian branch of SCAE, Speciality Coffee Association of Europe. SCAE is responsible for the competitions, we are the hosts and were fortunate to attract the interest from SCAE and that way were able to get the championships here. 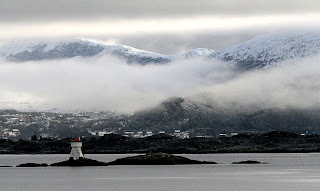 fooducation: What's special about the place Ulsteinvik? Kari: There are some practical/logistic benefits because it's easy to get here by plane. Also, there's just a short walk between the coffee bar and the hotel (venue for the competitions and lectures). It's got both the benefits of being somewhat rural but at the same time being urban. Some years ago I experimented and wrote about what happens if you cook an egg not in boiling water but at, say, 64 °C. I met upon some surprising results ("The opposite boiled egg"), but could not give good reasons for why. But now, at last, the answer to why has appeared in the scientific literature! According to Harold McGee the "[...] egg white begins to thicken at 63 °C and becomes a tender solid when it reaches 65 degrees". Furthermore, "The yolk proteins begin to thicken at 65 °C and set at 70 °C [...]". (McGee, pp. 85) The molecular gastronomer Hervé This also writes about this in a similar manner in e.g. "Molecular gastronomy - Exploring the Science of Flavor". So, for the perfect egg, keep it in a water bath at 65 °C for a long time, and you get an egg with a solid white and soft yolk. I tried cooking times between 1 and 26 hours, and at various temperatures, mostly between 62 and 68 °C. This is of course inspired by methods used for meat where you can keep the temperature at, say, 58 °C and the meat will stay red still after a day in the water bath (low temperature and sous vide methods). It's not unnatural to think that the same applies to eggs, since both meat and eggs are mostly proteins and water. 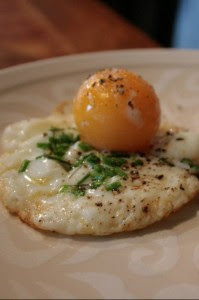 The picture to the right shows 68 °C egg creation by Finnish chef Arto Rastas, taken from Anu Hopia's blog molekyyligastronomia. See the bottom for recipe/procedure. In my experiments the eggs at 62-65 °C turned out "opposite boiled": a solidified (but not entirely solid) yolk came rolling out through a runny white! And on top of it, the time did seem to make a difference. Were my experiments poorly conducted, or was the suggested theory wrong? Recently, UNESCO inscribed two food-related traditions/cultures in their list of Intangible Cultural Heritage. One might say that finally food has officially received status as a true part of our common cultural heritage. Of course, food is culture and very few would not accept this as a fact. However, since numerous other cultural heritages are accepted as world heritage, it is important that food culture is not passed over. The UNESCO World heritage list is probably well known to most, but there is also another list called the Intangible Cultural Heritage list intended to safeguard immaterial cultural heritage. In this list, at least four entries relate closely to food and food culture.